Summary: Lydia Bentley has heard stories about the Montauk Project all her life: stories about the experiments that took place at the abandoned military base near her home and the people who’ve disappeared over the years. When she stumbles into a vessel that transports her to a dangerous and strange new reality, Lydia realizes that all the stories she’s ever heard about the Montauk Project are true—and that she’s in the middle of one of the most dangerous experiments in history. Alongside Wes, a darkly mysterious boy whom she is wary to trust, Lydia begins to unravel the secrets surrounding the project. But the truths behind these secrets force her to question all her choices. And if Lydia chooses wrong, she might not save her family but destroy them...and herself. 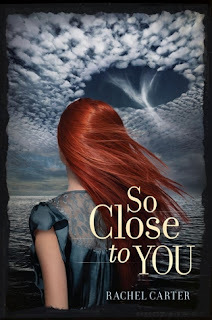 My Thoughts: Oh wow, how I loved So Close To You! I don't usually like any kind of book that is historical. I have problems getting into those time periods but So Close To You was fantastic. It's like Time Traveler's Wife meets Scifi Channel. We are introduced to Lydia who is your average teenage girl. She lives with her family including her grandpa. Her grandpa has a lot of theories about the Montauk Project, which is a space in the forest that used to exist. He has a lot of different ideas of what went on, what took place, and what exactly it is. Lydia tries to believe his theories but she really doesn't buy the whole thing. She loves her grandpa so most days she just goes along with it. One day while out exploring she opens up the door on a vessel and stumbles back into the past. Back in the past where her great grandpa and his family existed. She meets her grandfather as a 6 year old. Can you imagine what that would be like? She meets the rest of his family, she meets a few friends and a few new guys, including Wes. Wes was in the vessel that day and he is taken back to the 1900s with her. Wes was a very interesting character. I loved how he protected Lydia and tries to help her get the answers she needs. I loved how they felt about one another and how the relationship actually took a bit of time to develop. Of course with time travel, there is always the consequence of changing something. You've heard of the whole butterfly effect? So Close To You was an amazing read. I loved every minute of it. I loved seeing how Lydia gets herself into and out of certain situations. I loved how strong willed and smart she was. I loved how she interacted with all the other characters as well. Overall: I really loved this one. I can't wait to read the next book, I hope there is a next book!!! I loved Lydia and Wes, and Lucas, and Peter, and all of them! Such fun characters, such a fun and really "out" there plot. All in all, what a great debut. A mix of sci-fi mixed with romance mixed with time travel. Cover: Love it!!! She has such pretty red hair and love the way the sky looks. I'm looking forward to reading this one! I'm happy to know that it's good!